The governorship candidate of the All Progressives Congress (APC) has been elected after the primary election of the party which kicked off on Saturday, June 18 in Benin City, the Edo state capital. When the APC governorship primaries was about commencing formally on Saturday, June 18, the election committee chairman, Governor Aminu Bello Masari of Katsina state, assured the delegates that the committee will be fair and just to all. After the primaries was concluded very late, Governor Masari, who oversaw the conduct of the election declared Obaseki winner out of his fellow aspirants around 4:05am on Sunday, June 19. Godwin Obaseki, who doubles as the chairman of the Edo state economy and strategy team under the Governor Adams Oshiomhole’s administration. It was not just only about the Edo state economic and strategy team boss, who contested the APC governorship primary election, but there were other 11 contestants with him, when the primaries began on Saturday, June 18 at the Samuel Ogbemudia Stadium in Benin, the state capital. The other major aspirants were Dr Pius Odubu, the current deputy governor; a former governor and former senator, Professor Oserhiemen Osunbor, as well as a former Minister of State for Works, Chris Ogiemwonyi. The other aspirants who made up the numbers were: Maj-Gen Charles Airhiavbere (retd. ), Kenneth Imasuagbon, Peter Esele, Tina Agbarha, Blessing Agbomere, Emmanuel Arigbe-Osula, Professor Ebegue Amadasun and Austin Emuan. Punch informed that after the election was concluded, Obaseki got a total of 1,618 votes to win by a landslide margin over the other contestants. His closest rival was the deputy governor, who came a distant second with 471 votes. Imasuagbon and Ogiemwonyi had 247 and 137 to settle for third and fourth places, respectively. While, Airhiavbere got 11 votes while Arigbe-Osula had 10 votes. Other results are Esele (eight votes), Amadasun (eight votes), Emuan (seven votes) and Agbomere (five votes) in that order. The only female aspirant in the election was Agbarha. She had a total of three votes. The total number of votes cancelled was 41. 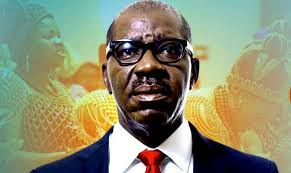 Prior to the primaries, the had been rumours that Obaseki was the anointed candidate of Governor Oshiomhole, based on the endorsement of the newly emerged APC governorship candidate by APC lawmakers in the House of Representatives and Senate, as well as various sociopolitical groups in Edo state. The election committee chairman revealed that voting would be done by thumbprinting on the ballot paper which bears the images of the 12 aspirants, adding that the delegates were expected to thumbprint on the ballot paper with the image of the candidate of their choice. Masari stated: “The aspirants are 12 in number; out of the 12, one of them must emerge as the candidate. If he emerges, he will need the other 11 for him to face the general election.